Holiday shopping is well underway this year, which means many consumers have already begun looking for those special gifts. And many consumers worried about economic conditions save time and money by purchasing their gifts online, rather than traveling to a traditional brick and mortar location. Despite this, some retailers may still be having trouble coaxing online shoppers through virtual checkout lines. But knowing when consumers are ready to buy makes it easier for retailers to do just that. To turn your browser into cold hard cash, consider these tips. 1. Free Shipping–Online sales peak the week before Christmas. Holiday shoppers are waiting for retailers to offer last minute sales. Offering free shipping or another last minute value when shoppers are looking to buy is a great way to capture a sale. 2. Holiday Keyword Phrases—Consumers often search for holiday specific items. For example, a consumer may go online looking for “Chanukah candles.” A candle retailer should use holiday specific keyword terms, such as “Chanukah candles,” and “Christmas candles” in their pay-per-click campaign. Remember that pay-per-click advertising offers great flexibility, allowing quick changes to ensure better targeting. 3. Update Online Inventory—Holiday shopping begins as early as October, with holiday traffic at its highest the week of December 3-10. That’s a large window of time when consumers are comparison shopping, and you want them to see your latest products and prices now. Holiday shoppers often visit not only your site, but also their favorite shopping engines, such as Nextag and Shop.com looking for better deals or gift ideas. Update your inventory with these shopping engines to capture as many potential customers as possible. 4. Catalog Requests—Retailers should have catalogs, brochures and other buying information easily accessible to online shoppers. Catalog requests don’t always mean a sale, though customers expect the information to help in their buying decision. These requests also help retailers get valuable e-mail addresses. 5. E-mail Marketing—Keep in touch with customers. Along with regular direct mail, retailers need to drop customers a line via e-mail. This is a great way to get the word out about last minute incentives to an audience you know is interested in your products. 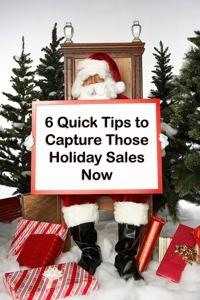 6.Turn Customers into Advocates—The holiday shopping season may last three months, but your relationship with the customer should last year-round. Social media marketing allows your business to create a two-way conversation with customers, creating loyalty, and building brand awareness. Blogs, message boards, and podcasts allow customers to interact with your business, and more importantly, it can help turn those customers into advocates for your business.